I've been waiting for this Basic Grey patterned paper to be available as soon as I first saw photos of it from Winter CHA. I absolutely love the color purple, but I don't have much of it in my stash. I used Mercy's sketch, SASSC11, for my card today. I wanted to add a contrasting color to the purple, but I also wanted to tone it down, so I chose Kraft. I stamped and colored headoverheels Huggabugg and it's hard to tell from the photo, but I added Star Dust stickles to her wings. I cut out my image as a circle, then I mounted it on cardstock cut out using the Blossom Nestabilities die. The rectangular Kraft panel was embossed with distressed stripes before topped with twill ribbon. 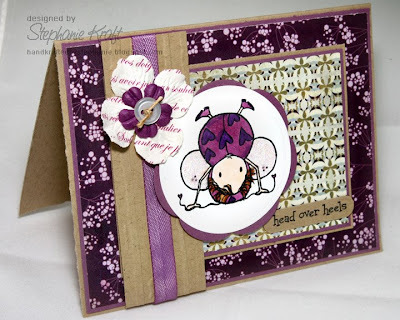 Accessories: Circle and Blossom Nestabilities (Spellbinders); Distressed Stripes embossing folder and Cuttlebug (Provo Craft), Markers (Copic), Word Window punch (SU! ), Star Dust Stickles (Ranger), ribbon and button (PTI), flowers (Prima), foam tape, twine. She is just darling! I got my new paper yesterday...can't wait to play with it.